Give the gift of life this holiday season with the American Red Cross’ 20th annual Holiday Blood Drive. Join WBNQ and the American Red Cross, and help be a part of the lifesaving force that is blood donors. 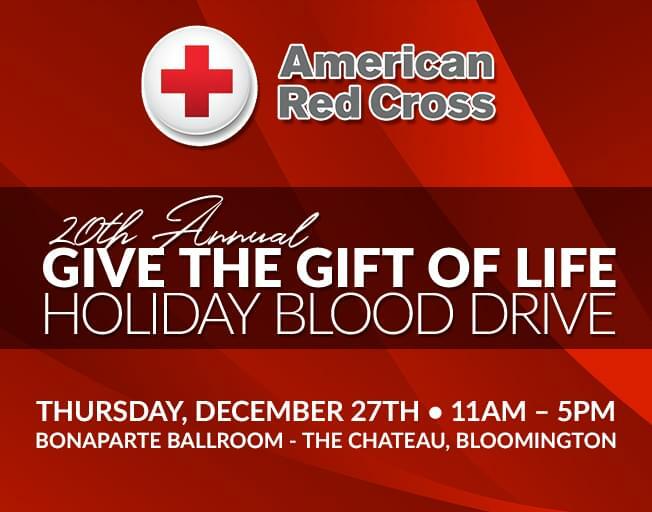 The 20th annual Give the Gift of Life Holiday Blood Drive is Thursday December 27th, 2018 at the Chateau. Stop by the Bonaparte Ballroom between the hours of 11am-5pm and donate a unit of lifesaving blood to the American Red Cross. Presenting donors receive a limited edition long sleeve Red Cross T-Shirt, while supplies last! To schedule an appointment, call 1-800-REDCROSS (1-800-733-2767), or visit www.redcrossblood.org. We will have great food and drink for all donors at the drive courtesy of local Bloomington-Normal Merchants!